It's half past six in the morning when the alarm clock goes. 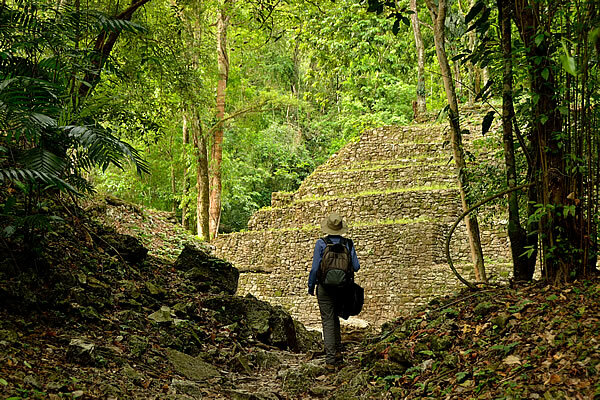 Today we cross the border between Mexico and Guatemala. However, it is not a normal border crossing, with barriers, immigration officers and people searching your bags for illegal goods. 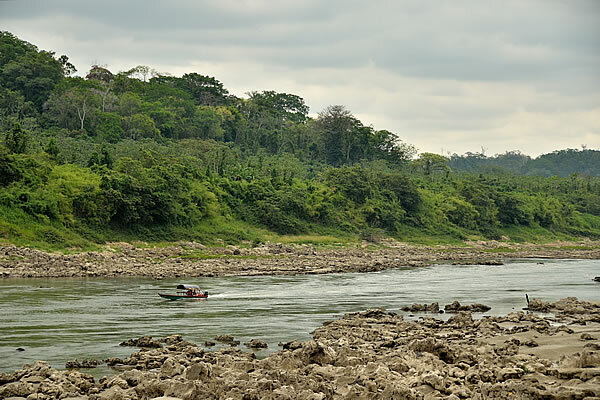 No, we are in the middle of the jungle, and the border between the two Central American countries here, is formed only by a 50 meter wide unguarded river (Rio Usumacinta). We just woke up in the Mexican settlement Frontera Corozal, and on the other side of the river are a dozen houses that form the Guatemalan village of La Tecnica. 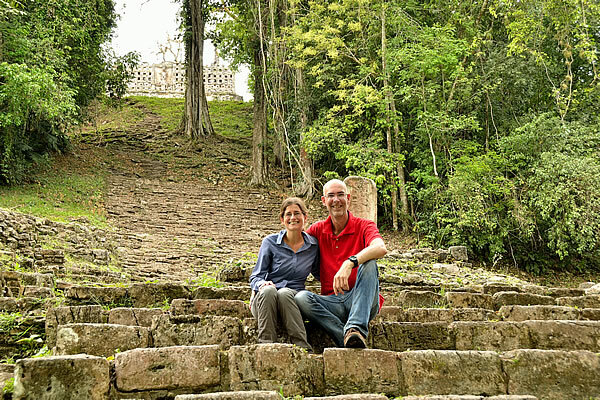 We visited the nearby Yaxchilan Archaeological Site yesterday and came to the conclusion that this border crossing is a so-called 'open border'. Many people cross the river, mostly illegally. 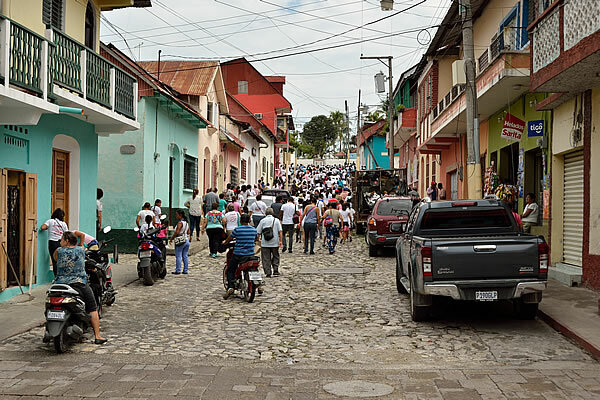 Every day, a handful of Mexicans cross the border temporary to do some shopping in Guatemala, while boats full of Central Americans travel illegally from Guatemala to Mexico on their way to the Promised Land: the US. Here we cross the "highway" of the Central American Human Trafficking Route. And the Mexicans don’t care, because they know that these illegal immigrants will not stay in Mexico. Yesterday afternoon we have already visited Frontera Corozal's immigration office to get the necessary Mexican exit stamps. Local people told us that it's not a problem to get your stamps a day before your actual departure. The immigration office that is located a few hundred meters from the river does not care about the people crossing the river illegally. This office is a 'one-man immigration show' purely for the Western travellers who use this border crossing sporadically to cross from Mexico to the northern part of Guatemala, or vice versa. When we visited the office yesterday to get the exit stamps, we had to make some effort to wake the guy up. We were probably the first customer that day. He tried to charge us some kind of exit tax of 306 pesos per person, but when we showed our plane ticket which we used five months earlier to arrive in Mexico, and which states that the "tourist tax" is included in the airline fare, he dropped the tax. After eating a few sandwiches, we walk with our backpacks to the river. 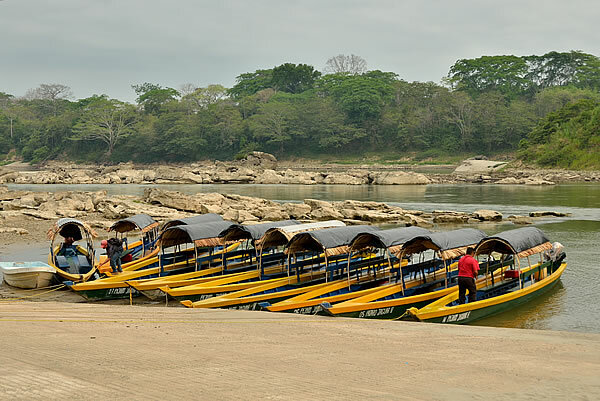 It does not take long before we are approached by an owner of a 'lancha' (local river boat). We agree that he will take us to the other side of the river for 50 Pesos per person (Euro 2.50). This is a good price because the ride takes only a few minutes. 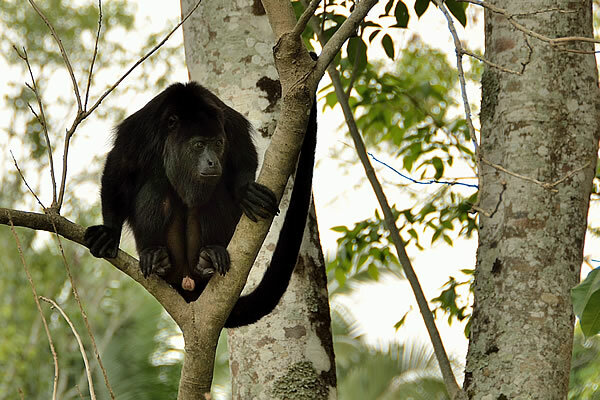 The sound of the powerful motorboat is widely overwhelmed by the terrifying roar of the Howler Monkeys, who inhabit the trees on both sides of the river. 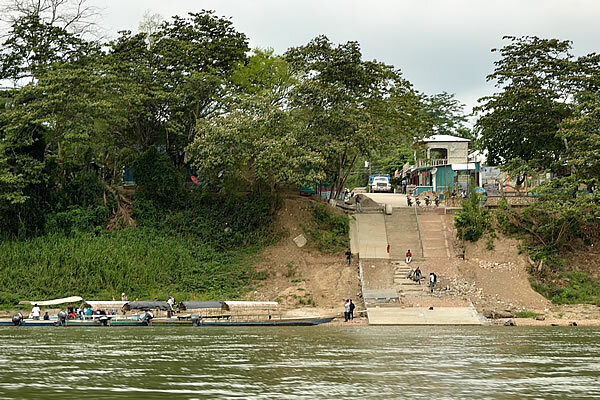 When we arrive on the Guatemalan side of the river, we are immediately approached by a few young men who turn out to be money changers. They both have a money belt attached on their waist, which undoubtedly includes an amount of money that will be comparable with an annual salary for many Guatemalans in this area. We still have a lot of Mexican pesos left. The young man initially offers 5% under the price, but after having some negotiations, we split the difference; 2.5% below the average rate. We can live with this at a remote border crossing without any ‘money changing competition’, and the money changer makes also a good deal. Earning five Euros with a currency exchange transaction that only takes a few minutes is a decent sum of money in a country where many people only live on a few Euros a day. With our Mexican Pesos changed to Guatemalan Quetzals (named after the national bird of the country), we walk further into the village of La Tecnica in search of the bus that has to bring us to Flores. We immediately notice that Guatemala is much poorer than Mexico. This settlement can earn some money with the border activities, but the houses and people still look much poorer than on the other side of the river. La Tecnica has no immigration office. We have been told that we need to get our immigration stamp in the village of Bethel, about half an hour by bus from La Tecnica. Fortunately, Bethel is on the route to Flores. A bus is already waiting further down the dusty street. The driver is standing next to the bus and has his blouse curled up to cool his big belly. It's only seven o'clock in the morning and it's already bloody hot. In fact, the bus driver tells us that the river is also a time zone, and that in Guatemala it's only six o'clock in the morning! We nod astonishment while the sweat runs in little rivers off our backs. The driver tells us that we have to wait until half past six until the bus leaves and assures us that he will stop at the Immigration Office in Bethel for our stamps. At exactly half past six we slowly drive out the village, while the driver constantly hits the horn as a signal that the bus is leaving. Here and there people come out from the wooden houses and climb into the bus. There are almost no cars in the village. Here people still depend on the bus or maybe an old motorcycle. By the time we leave the outskirts of the village we get on speed. But still not very fast, because the road is unpaved and bumpy. With a huge cloud of dust behind us, we drive to Bethel. At about seven o’clock we walk into Bethel's immigration office. The office opened a few minutes ago. The immigration officer just had a shower and is still walking around in his bare chest with a yellow towel around his waist. He apologizes, sits down in his ‘shower outfit’ behind his desk, and stamps our passports. Apparently he is not quite awake yet, because he lets us go without asking for a bribe. And that's something that's not very common at Guatemalan immigration offices.